The Lackawanna Valley embodies the American experience. The region’s anthracite coal, railroads, and iron works fueled the nation’s massive industrial expansion. Its industries staged some of the great battles between capitalism and social responsibility, and its people, the thousands of immigrants who came here to build a new life, ended up building a new nation. The tale of the Scrantons’ endeavor, Lackawanna Iron & Coal, is one of the greatest success stories in all of American manufacturing. After early failures, brothers George and Selden Scranton, together with their cousin Joseph, persevered and, in a bold move, expanded their little ironworks dramatically. They began rolling railroad rails, T-rails, the first site in America to do so on a large scale. The Scrantons also employed the new fuel found in abundance in the Lackawanna Valley – hot-burning hard coal. Though not the first to do so, they were among the most successful. So successful, in fact, that by the time of the Civil War, their little company had grown into the second largest iron manufacturing center in America. It employed thousands of people. Just after the turn of the 20th century, the forty-mile long valley had 110 collieries, large self-contained mining operations, along its length. At the time, half of all working age males in the Valley were employed in either mining or processing anthracite. Thousands more worked in the dozens of ancillary industries and businesses that relied on the coal trade. Between 1860 and 1910, industrial activity in the Valley expanded dramatically, acting like a huge magnet that drew thousands of new immigrants. Jobs were plentiful and, though austere, life was often better than before. Waves of immigrants came to the Valley, spurred by political turmoil abroad and encouraged by America’s open immigration policy. By 1900, the Valley was a hub of commerce, manufacturing, and transportation that had attracted a population of over 250,000. Towns sprang up throughout the Valley as immigrants flocked here to seek new jobs, new opportunities, and new lives. Distinct ethnic enclaves quickly formed. The Lackawanna Valley did not evolve into a melting pot. It became a patchwork quilt of languages, ethnic traditions, and cultures…all co-existing in one of the most densely populated places of 19th century America. We are here to tell the story. The Lackawanna Heritage Valley plays a vital role in promoting and preserving the region’s proud heritage and its recognizing important contributions to the history of the United States. We are here to tell the story. 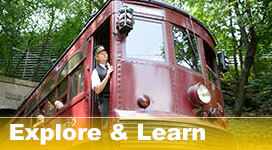 To experience the history of the Lackawanna Heritage Valley first hand, please visit our partner sites page. Copyright ©2018-2019. All Rights Reserved.